Have you ever passed by a house with such immaculate landscaping that it looked as if it belonged on the front cover of a luxury real estate magazine? Believe it or not, through carefully executed tree transplanting techniques, you can have beautiful, fully grown trees of any size right on your very own property. Want to purchase trees or relocate your existing trees? No problem. Give us a call at: (815) 469-6061 or contact us today! Many homeowners are unaware that the overall appearance and health of trees are greatly affected by the individual performing the tree service. The proper planting and care of a tree can lead to a healthy and strong tree for several years to come. However, when you hire an unlicensed professional it can ultimately damage the tree and abruptly shorten its life. As a result, you’ve wasted substantial time and money invested in raising a tree to its full maturity. When you choose a professional tree transplanting and relocation service like Arbor Care Inc., you can rest assured that we will perform your tree work properly and safely. 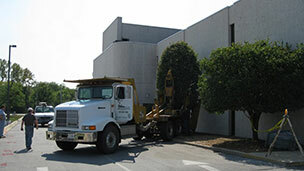 At Arbor Care Inc., we provide tree transplanting services all year round. Depending on the species you want, certain trees can only be dug in season in order to survive the transplanting process. We install an array of tree sizes ranging from small to large sized trees. We currently have five different tree spades available to install trees. Our specialists use two 90″ truck mounted tree spades for large mature trees, a 55″ truck mounted tree spade for the medium sized trees and we have 44″ and 32″ production diggers on track loaders. Click here to watch our latest videos on our professional tree care projects. Are you looking to plant large trees installed on your property to beautify and add privacy to your backyard? Need an evergreen tree privacy screen around your property or pool area, or as a beautiful backdrop for garden ponds or water features? Regardless of what you need, we can help. Our certified and professional arborists are prepared to provide you with all your landscape needs. To find out more information regarding our tree services and for a quote, call (815) 469-6061. We’re looking forward to working with you.